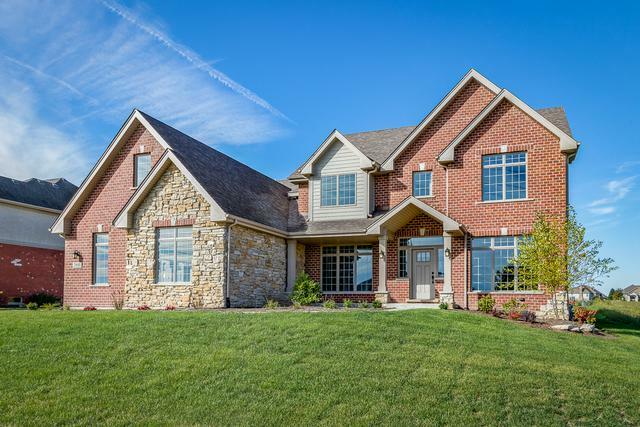 Fabulous new construction brick and stone custom 2 story! Features include much desired main level master bedroom suite with trey ceiling and walk in closet! Master bath suite includes whirlpool, separate sit down shower and dual sinks! Awesome entry (vestibule) with crown foyer, French doors and transom! Gorgeous formal dining room with oversized brick wall, crown molding and indirect lighting! Stunning kitchen with white cabinets, custom island, granite counters, stainless steel appliances, walk in pantry and fabulous engineered floor! Beautiful family room with cathedral ceiling and brick fireplace! Three huge 2nd level bedrooms with walk in closets! Huge 2nd bonus room! Excellent 2nd level loft! Large main level laundry room! Main level powder room! Full basement with roughed bath and 9 foot ceiling! Central vac! Anderson windows! 3 Car side load garage! Lincolnway East high school and more! Hurry!